The best travel deals and experiences! It is with light hearted and educated finger that I take to my keyboard today to tell you I have been taking a class on essay writing through The Great Courses. I love these courses and I can study everything from mental math (Still haven’t cracked the cellophane on that one) to Latin 101 (Its coming along but I have a ways to go) and Renaissance Italy which I lap up like a St. Bernard with a bowl of ice cream. Our first assignment is to write about a place we know intimately. 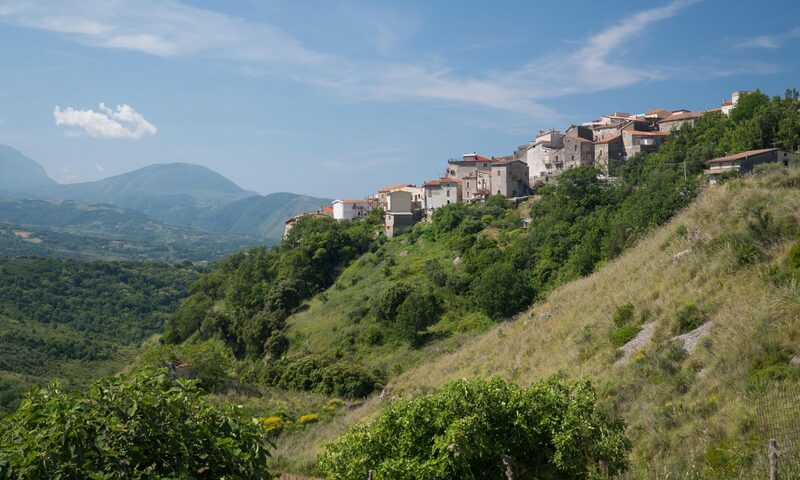 Of course our village, Santa Domenica Talao, Calabria comes instantly to mind. Our village, perched on a hilltop overlooking the Mediterranean has been, until recently, somewhat sequestered. Back in the day when it was not as easy to get around, most everyone stuck around the villages and unique personalities and cultures emerged in the minds and lives of the people. When you go to Southern Italy and visit the hill towns, you will be struck by the fact that each one has its own unique character. Maiera, which is close by, clinging to the hilltop like mushrooms on a tree trunk, is humble and reverent. Grisolia, high above the clouds overlooking the shimmering Mediterranean is warm and friendly. The beach resort of Scalea is untamed and a mix of cultures and colors, and our village is aesthetically beautiful, loving and playful. One thing however, that is taken seriously by all of these different villages, is faith. As any Italophile can tell you, the predominant religion in Italy is Catholicism. And although it is one religion, it has many expressions and runs deep in the culture of the tiny towns and villages all over Italy. 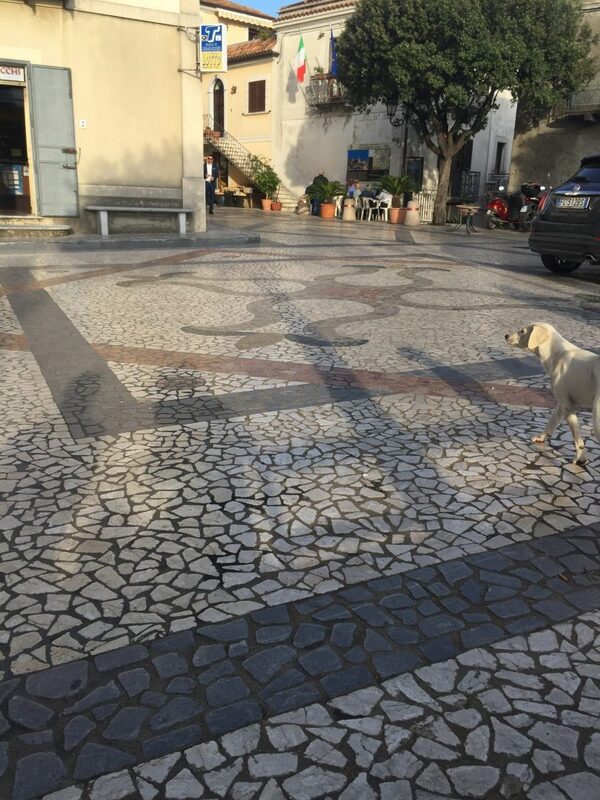 Our village piazza is dominated by a thirteenth century stone church that rises up in the middle of the village and, like a pin, holds the village together. Babies are blessed there, young couples are married there and when someone’s journey ends for whatever reason, they are given over to God there in a solemn ceremony and then a sad procession up the steep road to the cemetery that overlooks the village on the hill just above it. A villager has perished and the village is sadly diminished by one. In the church, from a special niche, the patron saint of the village, San Giuseppe, watches over his flock. Every year, in celebration of his day, the statue of San Giuseppe is taken from the church and in a loving procession is carried through the tiny vias and alleyways of the village. The villagers hang their best linens out the window as he passes and the medieval windows are dressed up in their finest clothes for a celebration. The statue of San Giuseppe is quite heavy and although he is carried by several strong men and jostled about as they make their way up and down stairs and steep alleys, winding through the village, he remains calm and unmolested. He seems grateful that they are willing to take him out on a tour so he can see what has elapsed since his last sojourn, and happy despite the villagers thwarted best efforts to carry him gracefully. When I arrived to Santa Domenica this trip, I had no idea it was patron saint day. Nonetheless, my beautiful house looked pretty neglected when I first walked up after a year of being gone. So I got out a broom and a trash bag and started cleaning her up. After much sweeping and digging the weeds out of the cracks in the stairs, I had her looking pretty spiffy. She looked like someone cared about her again and we were both happy. My neighbor, a sweet lady, paid me a compliment about what a nice job I had done on the walkway, porch and stairs. I accepted it and apparently had unthinkingly ingratiated myself to her as she thought I was doing it for San Giuseppe. Later that day I was on my balcony breathing in the crystal blue Mediterranean when I heard someone yelling. This person was obviously outraged and I wondered what could make any of our peaceful, loving neighbors so angry. I came out on the porch and looked. The medieval houses across the via from me rose up to the sky. The windows thrust open and heads thrust themselves out like a giant advent calendar. I looked at the stair leading to my house and there, perched on the top one was a perfectly shaped dog turd. Not just any dog turd this, but obviously one that this particular dog had put some thought into. Not a dog to just crank out something and call it art, he went the extra mile. It looked more like a perfect chocolate custard than a real turd but its placement gave away its true identity. My neighbor was livid and I secretly felt that she was vindicating me. How dare this dog defile my perfectly manicured steps! How dare he thumb his nose at my back breaking labor! Although, I thought, she is being a little excessive. I mean, I could just get a dustpan and handle it right there. Every head that was thrust out of a window had something vital to add to the conversation. My tiny neighbor stood yelling in outraged Italian, her shawl shaking in indignation and the Greek chorus of disembodied heads from the advent calendar were all singing in unison that yes, indeed it was a disgrace! Yes, an outrage even and how could anyone, even a dog (vile beast that this one obviously was) be so disrespectful? The cacophony went on for quite a while and finally died down. The advent calendar lost interest and one by one the windows closed against the heat of the Calabrian sun. My neighbor, still muttering went inside to nurse her grievance. I snuck out and retrieved the turd and relegated it to the trash. As I was idly chatting with Nunzia who holds court from her little market in the piazza, I learned that today was San Giuseppe’s day. A tiny lady in the doorway took my hand in both of hers and talked excitedly about the procession, the music and the lights. Her eyes lit up like a child’s talking about an upcoming birthday party. 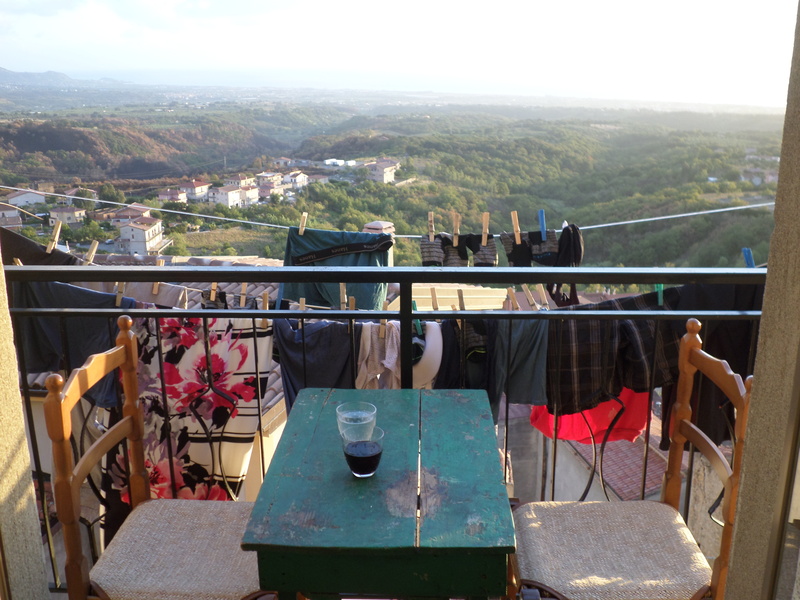 I had seen the procession of the Madonna Festival in Scalea just the week before and I learned that it was out of respect that you hung your prettiest linens out of the window as she passed, in her honor. Later in the day I went onto the trunk of linens that had come with the house. The lady who sold it to us had left us all the bedding and linens when we bought the place. 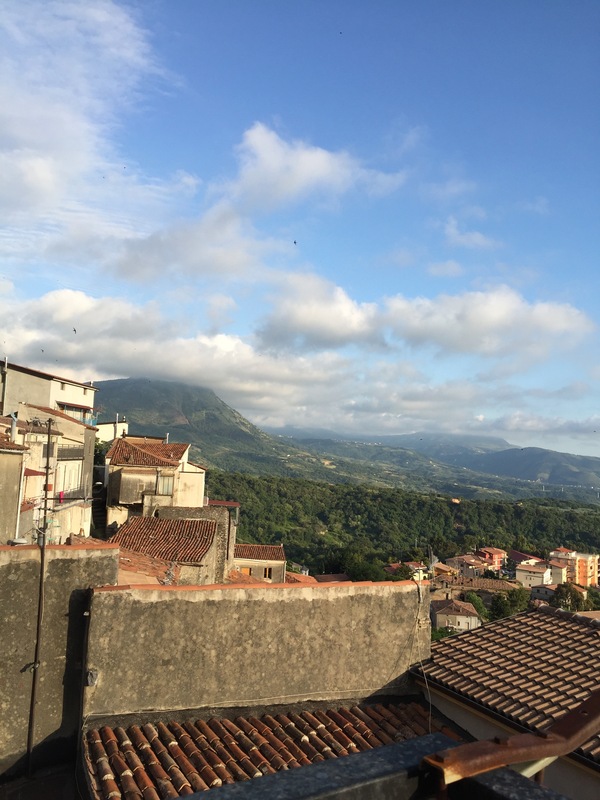 I found a pretty bedspread and hung it from my kitchen window which could be seen by the villagers and San Giuseppe as they walked by. As the procession began my husband and I went up to the church to watch the faithful spill out. 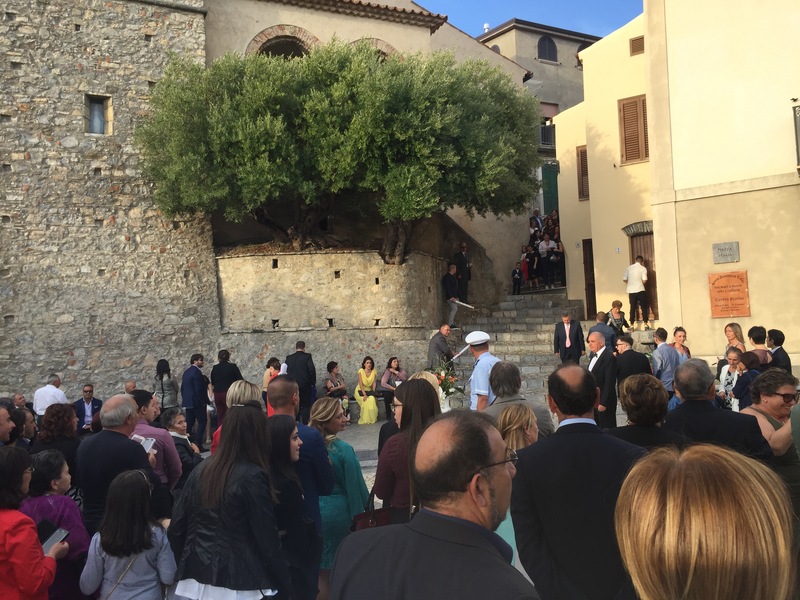 The villagers had spent hours making special baskets with flowers and ribbons that they carried on their heads in front of San Giuseppe as he made his way through the village. Then we raced back to our house and met our neighbors who were sitting on their porch watching the parade as it looped and wound its way through every tiny or forgotten via in Santa Domenica. The women were crying with love and gratitude. It was quite moving. And then I understood why my neighbor was so upset. This was her saint, the one who watched over the village and whom every villager loved with all their hearts. This calm and beautiful wooden statue was a symbol of perfect love, peace and harmony. And they adored him. Later there was music. Men, women and children were dancing the Tarantella in the piazza, the giant flowered tiles under their feet acting as their dance floor. 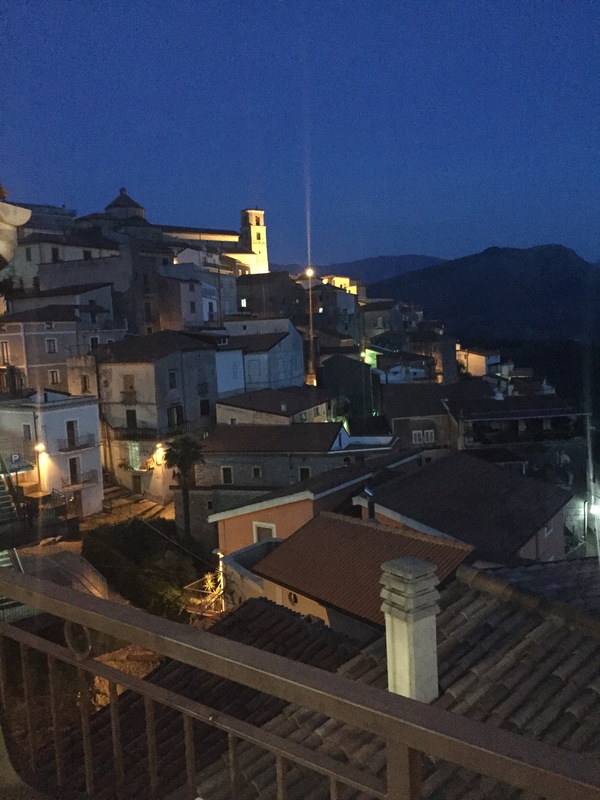 The steps of the church became seating for those watching the spectacle and the giant bell tower that wakes me every morning to the heavenly sounds of church bells watched over the village while San Giuseppe watched over the church once again from his perch. I am sure he was smiling calmly as he always does. Next PostNext Ruin Flippers! How Our House Hunters International Dream is Coming True AGAIN!